Unveiled at the Good Guys car show in Scottsdale, "Hot Rod" makes it's debut! 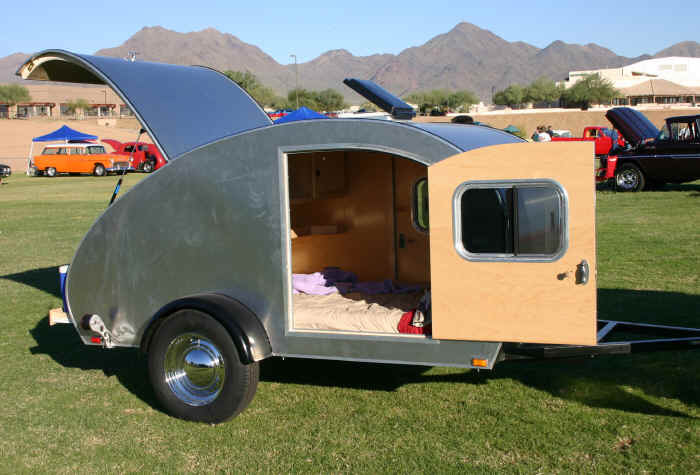 This time it was Doug's turn for a teardrop trailer. We all felt this one needed to be a five foot wide and since we were building our own frame we were not limited to the 4' width that Woody has. Scott made some shape changes to give a little bit more length to the inside sleeping area and it made the galley more useable. This unit is only a few inches longer than woody but it has quite a bit more useable space.